"What does it mean???". After seeing Hungry Bear's video for the umpteenth time I was inspired to whip up a "quick 'n dirty" wallpaper so I could have a double-rainbow on my desktop. My a href="http://digitalblasphemy.com/picklejar.shtml?i=doublerainbow3&mode=dir">initial version looked something like a "Double Rainbow over Death Valley". The Bear seemed to take a lot of heat for his exuberance, but I think it's great that he is enjoying all that nature has to offer. 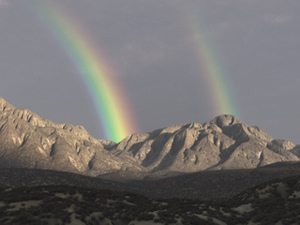 "Double Rainbow from the 2010 gallery"
The double rainbow over the mountains gives me peace being we struggle with the possibility of our dearly beloved Cybil (our canine ranch family member) crossing over the Rainbow Bridge this week. Cybil loves the mountains, the outdoors, running with our horses and chasing away varmints at our small working ranch. Decisions about maintaining the quality of life can be challenging. The rainbows offer hope, and it is hope we hang onto this day. Great tribute, Ryan. I only wish I was capable of producing as much joy from the sight of your image as Hungry Bear expressed in the vid. Oh, to be so pure. This is CGI??? Wow, Ryan! You have really outdone yourself with this image!!! I swore I was staring at a photograph even after I knew it was one of your images! This render reminds me of that youtube video "Double Rainbow Guy"
Makes me excited for my next vacation! Ryan, this has got to be my favorite piece of art you've created! It's just amazing. "Double Rainbow is really Not"
I use the 2560x1024 dual screen and though we have a full rainbow it's not double. Still very cool. 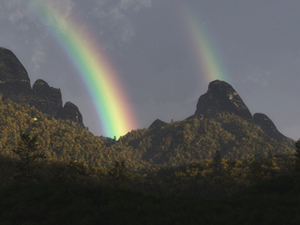 The "double" part of the double rainbow is missing on the 2560x1024 version. Hungrybear is his name, exuberance is his game. Perhaps I am missing it but in your description of the piece you say: "The Bear seemed to take a lot of heat for his exuberance, but I think it's great that he is enjoying all that nature has to offer." My only question is: what bear? I read that this took a while to render. does that mean that there is a less chance of having some dual, and triple screen versions? I read that this took a while to render. 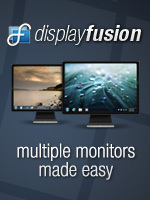 Does that mean that there is a less chance of having some dual and triple screen versions? "Hmmm, are there different suns?" Why does one rainbow go from Red to Violet and the other the opposite? Just tell me its multiple suns for this planet and ill be ok with it. "double rainbow display on my computer"
When I download this image, I do not see the water, are my display sittings wrong? Can you advise? Will there be a dual screen version of this? 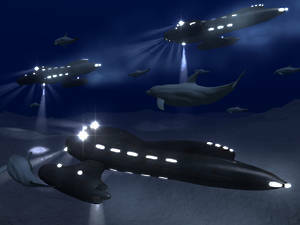 Looks amazing even better than the Orca under the ice. I like this one the bestest! I really like this version the best. Great job as always! I like this version the most. there you go--happy dance--is there a way to give this a 10+???? There are many things I love about this version - the reflection in the water is the first. Once again you have rendered something I want to be inside of. I like this, but I must admit I'm disappointed you didn't stick with the desert theme. Few of your images show the beauty of the desert, though many show mountains, forests, and lakes. I imagine desert is difficult to make visually interesting but what about something like this: http://www.flickr.com/photos/jimpatterson/4306397649/in/set-72157623227465594/, or http://www.flickr.com/photos/jpn/2380207632/ or http://www.flickr.com/photos/jpn/2324959450/ or http://www.flickr.com/photos/rolandito/4137324787/ or http://www.flickr.com/photos/31550808@N07/4351633569/ ? Something like this would be wonderful with your rainbows, IMHO. Just an idea. I love how a funny joke turned into a great wallpaper. Great job! I love the reflection of the rainbow on the water! The blend of colors in the whole picture is also very appealing. Wow, this one is definitely the best so far. Like Wraith said, the third time is the charm. :) Absolutely stunning! LOVE THIS VERSION. Was a little iffy about the first 2, first one seemed a little too plain, second one didn't feel quite right, this defintely deserves to be the final render. Nicely done, looks great. This latest version is absolutely gorgeous! Love it! "Full On, Across The Sky!" What was wrong with the desert look? I also don't think the mountains in the background go well with the foreground. Just a personal opinion. Regardless, keep up the great work. I love you art. Hey Ryan, did you use Terragen for this render? The texture of the foliage reminds me of a lot of other images I've seen made in that program. I really didn't like the original. This is a vast and beautiful improvement. I am continually amazed by your work. "Double Rainbow (2010) 2nd version"
just a thought... Keep it up! "I love being a member!" 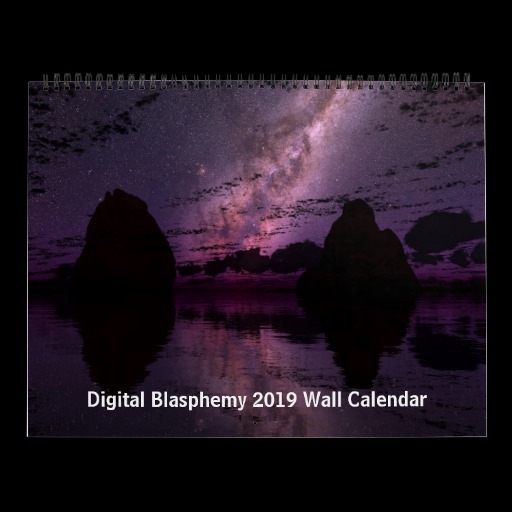 I love being a digitalblasphemy member and seeing your creativity come out in such unique ways! What started as a simple lighthearted joke is shaping up to be one of my favorite pieces! I totally agree that there should be a version with Hungry Bear jumping up and down. I look forward to the final product (and the dual monitor version...)! one of the most beautiful things I have seen. It didn't refresh so i tried again since it was still on my screen. I like the update. Maybe a little less mountain on the bottom & a little more sky. Rainbows appear after it rains... then wouldn't it be misty or water be dripping from the trees? something like that? Wow, you read my mind! Being a flat-lander from Illinois, I grew up with rainbows in the background. Now, living in Utah, I frequently see rainbows that end in the valley with the mountains in the background. 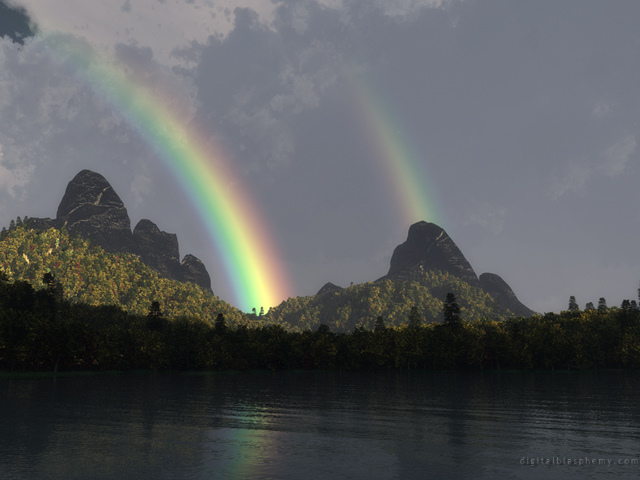 Try rendering an image with mountains in the distant background and rainbows in front. They look cool! I can appreciate that the muse descended and out came the double rainbow, but are you still working on the double screen render of Subartic without the whale? I've been waiting on that one ever since last week when you said it should be available shortly. The rainbow is nice, and its good to see you working on things you enjoy, I've just been looking forward to replacing Extrasolar for a long time now. "A suggestion if you're going to keep tweaking..."
I've noticed with most rainbows (and it shows pretty well in the video) that the sky is brighter inside the rainbow and darker outside. I can't tell if you've done that here - maybe a little more prominent would be better. Great work btw! "LOL....haven't laughed that....INTENSE....in a while!!!" OMGoodness that was SOOO funny!! Thanks for the laughs Ryan!! "Good for You - Keep Going"
I love it when a nice idea becomes art this quickly. Double rainbows are quite wonderful. I hope you'll keep going to polish this up with some foliage, water or surface detail as others are suggesting, and it will go from nice to great. I really like this one even in its "unpolished" state. I get the joke but couldn't get myself to watch the whole video. Double rainbows are rare and great (we even get them every now and again here in south Texas) and now I've got one on my desktop. Here's my suggestion... instead of hills in the foreground, how about a nice lake with the rainbows reflected? Put a silhouette of a tree in the foreground to give it some depth. This wallpaper has a LOT of great potential. Definitely keep the original if you decide to ramp it up. This looks total Bryce dude I give it a thumns down! This will be the first wall in a long long time that I just can't imagine using. Please do some more cityscapes. Please. I miss those days. So many good cityscapes here. This must have took a full 20 seconds to render! ...did you have to let it finish on your other machine? Sometimes you got to have a good laugh right Ryan? There's not much to laugh about when you're spending two solid weeks or more on a single project. You hammered this bad boy out in one afternoon. Would I give it the full treatment? Absolutely not. Just move onto your next concept and leave this be as the practical joke of the year. I think it would be neat if the first impression was of a double rainbow in a Yosemite, but when you look closer the "trees" are actually giant mushrooms. Something else appropriately alien might work too. Another possibility which comes to mind is to put an emerald city at the end of each rainbow, peeking over or on top of the mountain. Maybe it's my monitor, but something seems a little odd about the foliage-covered parts of the mountains which I can't quite put my finger on. Now that I know about the Hungrybear video, I think it's great that you played along, Ryan! I think it stands perfectly as-is as a joke piece. That said, I think the full treatment from you would result in a beautiful work. Definitely work your spirit fingers on this one. A night scene would be good, and a sunrise one as well. Love rainbows, so you couldn't go wrong (with me) with this one. Absolutely give it the full treatment. It's on my desktop now, just so I can enjoy the rainbows. I think you absolutely SHOULD put the full treatment into this one... but make it into something your own. Don't make it look like the arid video, put some Ryan Bliss magic into the mix, add some green and make it beautiful. I think it's got lots of potential. Hi Ryan! I saw the image before title and text in your facebook update, just after watching the famed video. Thanks for the laugh. The image looks promising too. Thanks for the image, and I love the joke too. You could do two treatments: 1, a day-time scene like this and 2, something very abstract and psychedelic. I love the joke of this one. I'd love to see a "polished, finished" one. Could really be stunning. Anyway, the image is a very nice sentiment, but the lighting and curvature of the mid-ground and background mountains look too fake. Too smooth and the valleys look too uniform to appear to be natural erosion. It may be the lack of anything going on in the sky. However, the foreground looks fantastic. "The Desert & Rainy Season"
I'm experimenting with some more "Yosemite-like" foliage. Good catch Will. I've known the power of Double Rainbows for a long time now! Go for it -- I'd love to see the polished version. I love desert scenes anyway. Perhaps a saguaro cactus or a large cholla cactus on the left? I'd like to see you give this scene the full treatment. It would look amazing. Go on... All the way! The funny thing is one of your early works also has a double rainbow "Rainy Season - 1999". 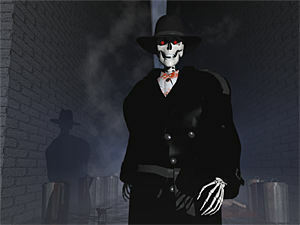 When I was starting out I would do a render in an afternoon and post it that evening. As time went on I chose to spend more time on each project and try to post more polished work. The upside is that each piece is higher quality and more detailed, but the downside is they take a lot longer to create. Those of you who think this looks like some early DB are spot on. This is how I used to work! Talk about a real suprise. Was shocked to see another render just a week after subarctic and at first look my impression was "this just doesn't have the finished quality of DB". Definitely should give this one the "full treatment" - it may be based on a meme, but it turned out pretty, and with your typical attention to detail it could be BEAUTIFUL... then you should point Hungrybear to the page and give him a shock! ""Woah! That's a full rainbow! All the way!"" Even though it was intended as a joke, I would love to see a full render of the scene. It does have a nice look to it. if it were me, i'd leave it as-is. your image is as spontaenous as his over-the-top reaction to the rainbows. i'd leave it alone. maybe a pickle jar render, but i'd leave this in the main gallery. I knew not everyone would get the joke, but it's fun to lighten up once in a while. Wasn't sure how much time it was appropriate to spend on a joke render based on a meme. Do you guys think I should give this one the full treatment? How about a picklejar, if you decide to improve this one, and rename it "What Does It Mean?" I guess most members are used to "serious" work from you, Ryan, and don't expect jokes. I thought it served its purpose; how wonderful could a render be since, as you said, you whipped it out in an afternoon? "I'm all for enjoying Nature's surprises, too"
I've lived in Virginia Beach for 24 years, and I can count on one hand the number of times I've seen a rainbow, so it is still new and fresh for people who don't get to see them often. OTOH, when I was stationed in the Azores, we had rain every day, and rainbows every afternoon. I would have The Bear's reaction when I saw triple and quadruple rainbows! They could make a long day at work "bear"-able. If this is a joke, then cool. That YouTube video is hilarious and this is a cute homage to that, but I can't bring myself to actually download this wallpaper as is. this is Ryan funny side! just enjoy dudes! what does that mean indeed! and for those critics... OLD DB RULES! this is just a "quickie" 3d work from Ryan! HE can do 1000 times better in terms of detail! Well that was a strange video. The rainbow was amazing, though. And this one looks great as well, although there is something about the mountains in the back that looks not that great... I think maybe it's the folds on them, particularly on the top left side. I do like the light foliage on the mountains, though. Amazing that it was done in just one afternoon. I'm with Mirek... it seems very underdone. Takes me back to the old DB days as well. I don't know, something about this just kind of harkens back to the 1997 images for me. It seems to lack the intensity of some of the others and just doesn't stand out. It's so intense, so intense. Double rainbow. It's like it's red, and orange and yellow and blue all at the same time. And there are two of them, and they're in the sky and it's OMG. This is too funny! I love your wallpaper art! People ask me all the time at work where i get all my awesome "screen savers" (ha ha the pc illiterate...) and i give them your link! Keep up the good work! But What does it mean? OH WHAT DOES IT MEAN! OMG that video was hilarious lol. Thx for sharing that Ryan. The picture is awesome but I don't know if I could ever look at it objectively after watching that video lol. I will just laugh every time I see it. And for that I love it all the more lol. Pretty good for something you just made on a whim. However I agree that the mountains could look a little fancier, and maybe add more to the foreground? Keep up the good work though! This... is freaking AMAZING. Ryan... dude... bahaha. You just reached a new level in my book. I think this may be the first comedy wallpaper in the history of DB. I think I'm gonna cry, just like THAT GUY. lmao. Love it! Thanks for making it. The video is a crack up but you're right, there is something awesome about nature and you captured it! Thanks for all that you do. "I love the double raindow "
This makes me remember an amine series I watched sometime ago called Mushishi, in one episode there was this guy that had an obsesion with finding the "fake rainbow". The identifying trait was that the colors were inverted compared to a normal rainbow like the one above. I loved the video and I like this picture just as much. It is quite different from most other recent renders. My one wish is that the mountains were a tad more detailed- maybe it's just me, but they seem a little odd. Not like the super-detailed ones in Shanshui. Nonetheless, great work.